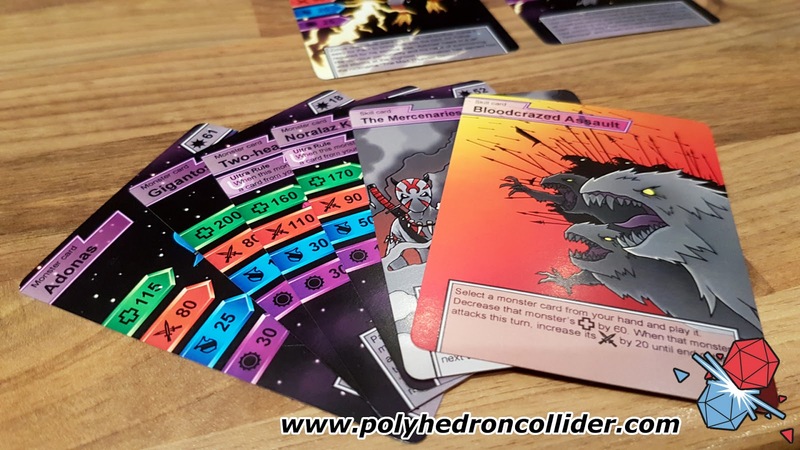 As a newcomer to the inner sanctum of Polyhedron Collider, it was about time I got stuck in and pulled my weight, which as I get older is steadily increasing. Perhaps we need to introduce some kind of exercise regime here at Collider Towers. But I digress. 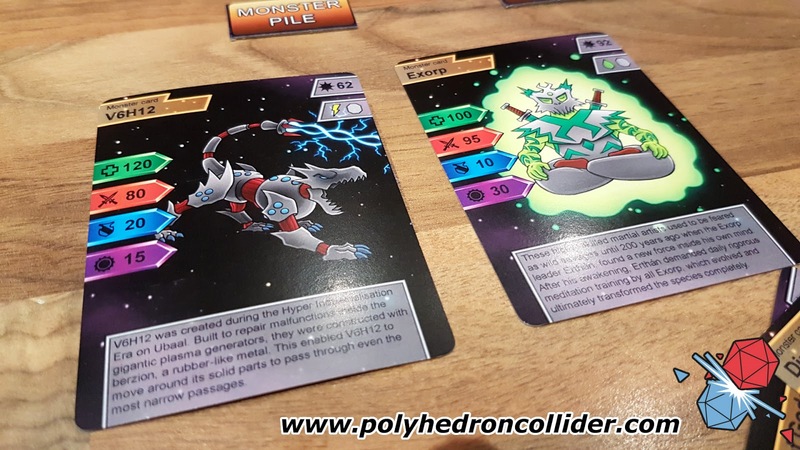 We recently received Magmeda Monsters from Andre at Rapid Leaf Productions; a card game centred on a galaxy containing a lot of Monsters in the Magmeda Galaxy. Pretty self-explanatory really and in keeping with the complexity of the game overall. The aforementioned monsters are sat on two sides of a war – the Liberation side or the Oppression side, each represented by their own deck. If you can hear the resonance of a Star Wars-like theme, you’re not the only one, although the two sides is about as far as this likeness goes provided you don’t count the Force powers…er..I mean magic. 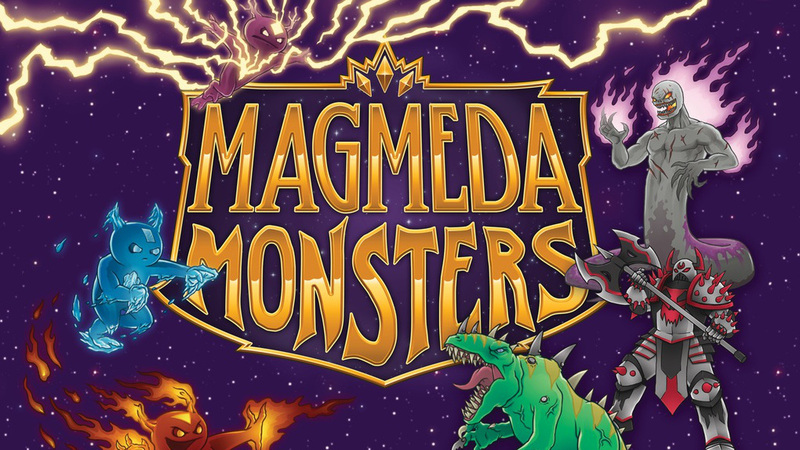 In case it’s not obvious, Magmeda Monsters is a two-player game which takes place over three rounds, each consisting of up to 18 turns. Why this can’t be 9 turns where you each take an action I have no idea, as each turn is repeated for the 2nd player anyway. In fact, whilst I’m on the subject, the rules in general could do with a little more clarity. Given the prototype nature of the game, it’s certainly not a deal breaker as Andre has time to improve the manual, but it did make understanding the game a little harder than it needed to be. Each player takes it in turns to deploy a monster from their hand, get into a fight in an attempt to knock out their opponent’s monsters. First to do so wins the round and it’s best of three. Each monster has stats such as Defence, Attack, Hit Points and Magic. Magic can be used to increase the value of one other stat ahead of getting into a scrap. Monsters also belong to various classes which have no other purpose than to allow the use of special abilities – some monsters have them, some don’t – this seems quite arbitrary, although mechanically it works well enough. Special abilities are detailed on each card to which my opponent commented that they’re a little hard to read if you’re not the owner of that card. This makes it very difficult to plan a defence if you’re on the receiving end – especially so if there’s persistent effects to take into account. If there’s no special ability, then the text is simply some Lore around the monster, which adds confusion as to whether there’s an effect or just some waffle on the card. I think some sensible iconography might be a better approach. We then come to tracking the monsters’ effects, hit points and abilities which is where the game begins to unravel a bit. 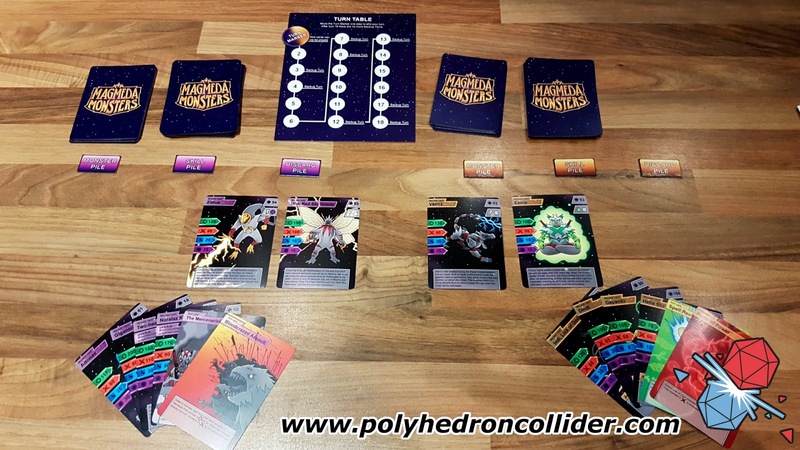 For a game that comes with a set of tokens to identify packs of cards and a turn track, there is a curious absence of anything to allow you to track the business end of the game. A redesign of the back of the cards would allow easy pack and monster/effect card ID and free up some resource for a HP and effect tracker instead of the recommended “paper and pen”. Whilst paper and pen is a good, old-fashioned, tried and tested solution, I can’t help but feel that a game should be self-contained, especially one so simple. So, we inexorably arrive at the combat, the rare steak and triple fried chips of the game and unlike such a meal, Magmeda Monsters is neither tasty nor satisfying. If anyone remembers Top Trumps, I am persistently reminded of that – one card against another card until one number gets to zero. Sure, you can gang up multiple monsters against a single opponent, but it’s still just making your attack big enough to overpower the defence and give the victim a damn good shoeing like a group of drunk hooligans in a city centre on a Saturday night. To return to the food metaphor, it’s like expecting a full roast with all the trimmings and being served a small salad with a bit of cheese. Not an awful affair, but hardly going to set your taste buds alight. I’ll confess that card games are not my usual affair, but there are some that I’ve really taken to; Dominion, Netrunner, even Battle for Sularia wasn’t bad despite finding the game-breaking mechanic that allowed me to tear Steve’s defence a new one, but Magmeda Monsters just isn’t grabbing me - either pleasantly for a quick fumble in the bike sheds or less amicably by the short and curlies. There is the bones of a reasonable card game in here somewhere, but there’s just not enough as it exists to make it a stand-out game for me to recommend. There’s something missing here and it’s tough to put my finger on what that “something” is. More cards? More options? A bit of something different? Who knows. The idea behind the game is a good enough setting and Andre has set up an interesting universe, but for me there just isn’t sufficient in the game to captivate me. I’m trying really hard to like Magmeda Monsters, but the more I think about it, the more I think it's just Top Trumps with a vague Star Wars-inspired battlefront and like the stereotypical nerd at high school, it lacks the charm of the former and the coolness of the latter. Magmeda Monsters is on Kickstarter now.